DIY Wedding | I love weddings! Gerbera Daisies are popular wedding flowers. They are simple, beautiful, bold, and come in a variety of vibrant colors. I have featured a DIY Calla Lily Bouquet in a previous post. The technique is a little different from the Calla Lily bouquet, but they are both easy to do. The bouquet featured uses 12 flowers. Gerbera Daisies are so readily available, stop by your local florist and start the experiment! If you plan to do the bouquet ahead of time, check out afloral.com for silk flowers and supplies. Now that you have decided to bake your own wedding cake for 300 guests. The baking part was a breeze, decorating may be a bit challenging but fun. But how does one transport a beautifully decorated masterpiece to the wedding location? I recently watched the TV show “Let Them Judge Cake”, where 4 contestants competed to create a 3-foot-tall cake in 7 hours using one of Disney’s Pixar movies as theme. 1 of the entries fell apart during transportation from their station to the cake table it was hard to watch. In that case the contestant obviously lost the challenge. In the case of a wedding cake, much more is at stake. The base of the wedding cake should be able to support the weight of the cake. Usually, having a base of three layers of cardboard is adequate support; but if your wedding cake is very big and heavy, you should place an additional base of fibreboard or wood beneath the cake, before moving it. 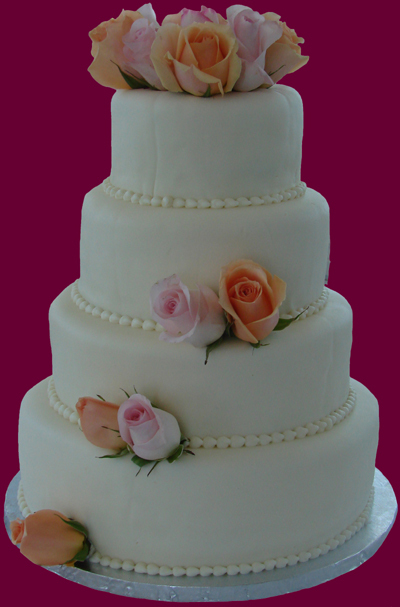 If your wedding cake has tiers that are held up by pillars, you need to move the cake without assembling it. Store the separate tiers in cake boxes, which are large enough to hold the tiers, and transport these to the reception venue. Take the pillars and other decorations separately. Once you reach the venue, you can assemble the wedding cake properly. Never keep the cake boxes on the seat of the vehicle while transporting. The seats are not level and there is a chance of the boxes shifting, thus ruining the cake inside. Put the boxes on a foam mat, which in turn is placed on a flat surface. This way, the box and the cake inside, will not shift during transportation. Wedding cakes that have the tiers stacked on one another can be moved assembled. Transport the cake in a vehicle that is big and high enough to hold the cake comfortably. On reaching the wedding venue, do not attempt to carry the cake, no matter how strong you are or how much help you have. Instead, ask the location manager if they can provide you with a cart or a table on wheels, on which to move the wedding cake. Move the wedding cake to its designated spot, put any last minute finishing touches, and the wedding cake is ready to go! Finding a decent cake can be a pain. The designs are either really blend or they get expensive. With a passion towards baking, I started wondering how hard it is to make a wedding cake. The baking part is a breeze, but I haven’t mastered the icing to make it look baby smooth (in fact it usually resembles swiss cheese). But if other people can do it, why not I? So here it is. An awesome video showing step-by-step how to use the skills us casual bakers already knew to put together a wedding cake. If you are one of the brave ones who attempt to make your wedding cake after watching this video, post a picture or helpful tips – would love to be inspired. This is the first of the wedding cake series. In this series you will find recipes, tips and techniques on making a beautiful wedding cake without spending a fortune. As mentioned in my previous post, one way to save on wedding cake is to have a gourmet cake that doubles as dessert. This Italian Cream Wedding Cake found in one of Martha Stewart’s cookbook definitely qualifies as a gourmet cake. This recipe is not hard to follow, especially with the help of a Kitchen Aid Mixer. Decorating depends on the style you choose, and can be challenging. If you have a baker in the family and is willing to help out, send that person to a Wilton cake decorating class ~ it’ll be time and money well spent. How fancy the decorations depends on how skillful you are. Consider decorating with fresh flower (see below) to keep things simple. Styrofoams in the shape of your wedding cake make good canvas for practicing. As with anything DIY, practice and experiment until you find the right fit for you. This Italian cream cake is a dense, moist white cake made with buttermilk. You could also try making cupcakes with this recipe, but the baking time will vary. 1/2 cup solid vegetable shortening, at room temperature. Preheat the oven to 325F. Butter and flour cake pan, then line with parchment paper. Using an electric mixer, beat the egg whites until soft peaks form. Gradually beat in 1/2 cup of the sugar until the mixture thickens to a meringuelike consistency. Set aside. In a separate bowl, cream the remaining sugar with the butter, vegetable shortening, and vanilla. Add the egg yolks, one at a time, until the batter is thick and well blended. Stir the baking soda into the buttermilk and set aside. Sift the salt together with the flour, and add to the butter mixture alternately with the buttermilk, beginning and ending with the flour. Fold the egg whites into the batter. Spoon the batter into the prepared pan, filling it two thirds full, and bake approximately 55 minutes, or until the cake has pulled away from the sides of the pan and a cake tester inserted in the center comes out clean. Cool cake in pan for 10 minutes; remove the cake from the pan and let cool completely. Use cake flour, sifting it before measuring and then sifting two or three more times with the other dry ingredients. Don’t forget to butter and flour the cake pans, then line with buttered and floured parchment paper. For nice and even sides, form a collar of parchment paper and line the side of each pan. Fill cake pans 2/3 to 3/4 full of batter. Different layers require different baking times. Check the cake layers several times during baking for doneness. To test for donesness, insert a toothpick or skewer into the center. It should come out clean (with the exception of some chocolate cakes, which may still be moist in the center). The sides of the cake should be pulling away from the pan when the cake layer is done. If the center doesn’t seem to be cooking, reduce the oven temperature and extend the cooking time. Check on the cake constantly not to burn or brown the cake. Cool cakes in the pans for at least 10 minutes before turning them out onto wire racks. Carefully peel away the parchment paper, invert the cakes and cool completely, right-side up. All layers should be the same height. Uneven layers make an uneven, crooked-looking cake. If the cake has risen higher in the center, trim it off with a sharp serrated bread knife. To freeze the cakes, let it cool thoroughly, wrap in plastic wrap, and freeze on cake cardboards. Be careful not to bend or damage the individual layers. Make sure you have plenty of room in your freezer for all layers. Always frost the cake the day before the wedding and refrigerate it so the icing will be thoroughly chilled. Decorate the cake with flowers, spun sugar, etc. as close to serving time as possible.